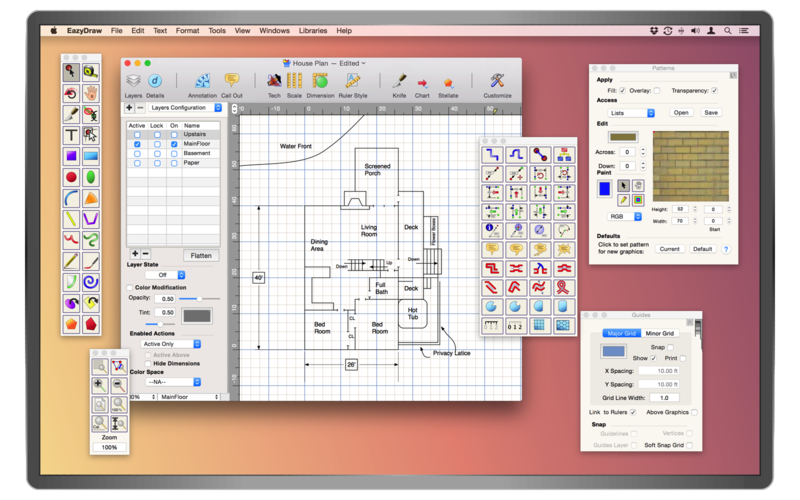 EazyDraw provides a balanced feature set that includes tools needed for technical drawing, Web and app graphic design, print publishing, logos, page — text layout and more. Easy enough for everyone, but with the depth your project will need. Dimension and Connector snapping to groups. Snap points near the top of a group were not being detected. Problem fixed. Possible crash when adjusting the overall length of a Dash pattern on the Dashes palette and / or the vector Hatch palette. Further corrections for the intermittent issue of setting line weight, dash pattern or arrows from the Attributes bar. In rare cases use of the Attributes bar popup menus would disable use of the corresponding controls on the Color and Style, or Dash, or Arrows primary tool box palette. Hopefully this is fixed now. SVG support for CSS constructs of the USE property. There were issues causing a crash, and other problems associated with inheritance of color and style attributes. Imports using these constructs now seems robust.